Today is the fifth anniversary of the day Mommie died. I’ve been thinking of her so much lately. I miss her in ways that sneak up on me and hit me upside the head like a baseball bat. I’m momentarily stunned and then I feel sad. Or I laugh uncontrollably. Or I get a warm fuzzy feeling. Or I get so angry I grunt and stamp my foot. I firmly believe that all daughters feel these things about their mothers. 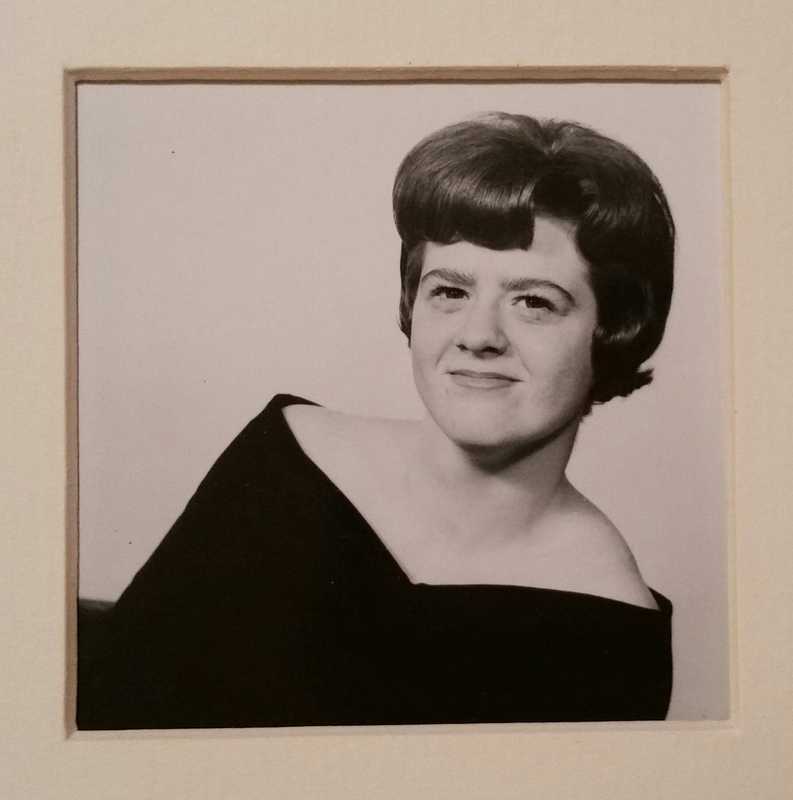 I’ve written about my mom before, But I’m not going to talk about our unpacked baggage, or our love of robin birds, or the gift of silly memories. I’m just going to share my mom. 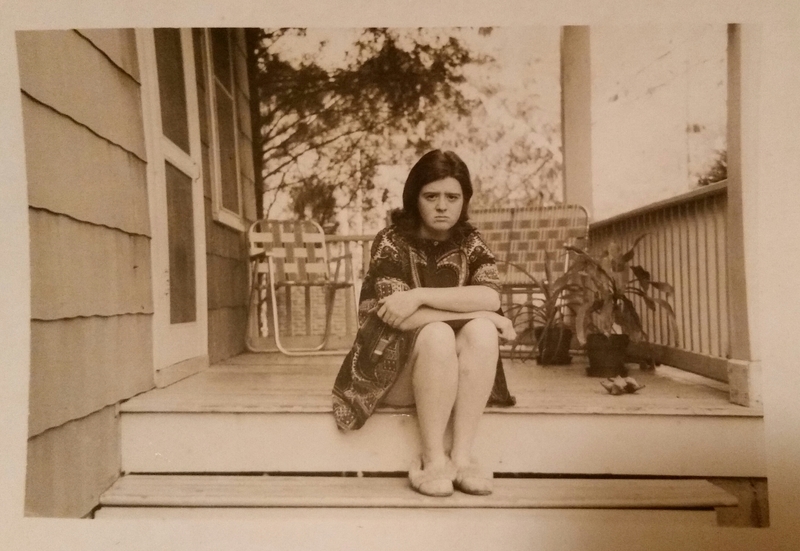 This is my mom when she was sassy AF. I think she’s so beautiful. This photo was taken in the mid 1960’s. I think my mom stopped being sassy when her mother died. She looks different in any photo taken after 1969, like something’s just a bit off…or something. Now, this is just my theory…but I do know that death of her mother changed her greatly. This was taken at our house on Barton Street in Arlington. I suspect my dad took it. It was before I was living in that house, but I don’t know how long after they were married this was taken. Some time in 1970. I think she’s beautiful in this photo too, but she looks different. 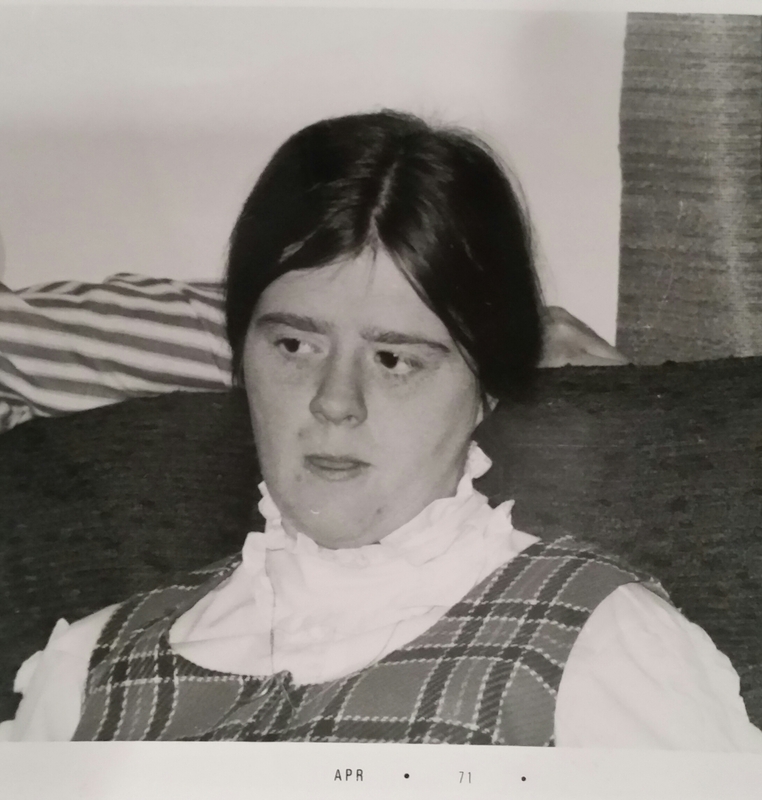 This photo was taken in April of 1971. The month before I was born. I think she looks tired. But I’ve been that far along in a pregnancy twice in my life and I remember feeling tired. I’m so glad that the middle part went away for a long time…does it really look good on anyone? So, my parents were pretty freaking strange. And quite possibly they shouldn’t have been allowed to bring me home from the hospital. I’m the weird little alien looking baby. 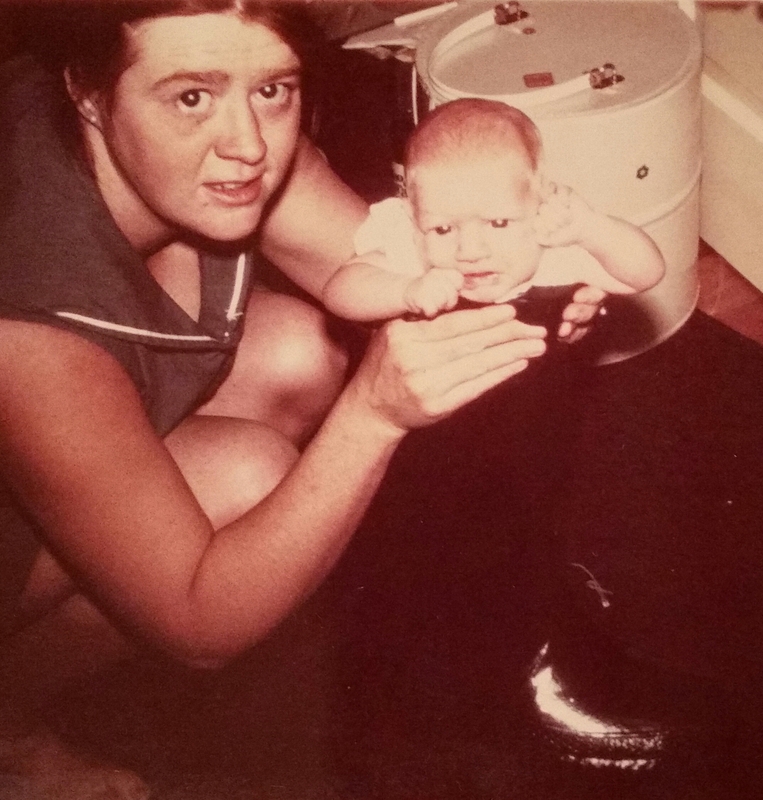 My mother is holding me inside my father’s boot (he was a motorcycle cop) as he takes the photograph. Obviously, I wasn’t a very cute baby…though in my defense, I’m kind of crammed into a big leather boot. That makes for some uncomfortable faces. Summertime 1971. 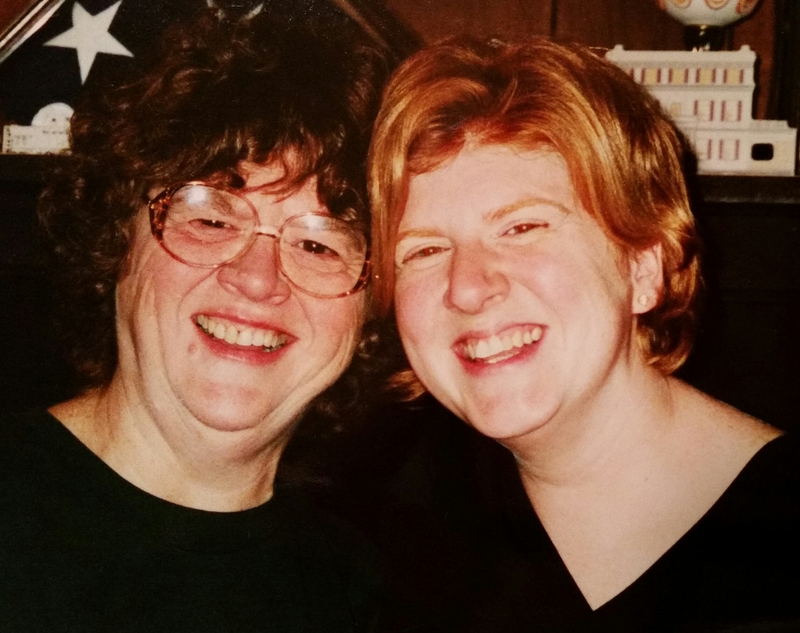 I went through years and years of photographs trying to find some of me with my mom. There are tons of photos of me with my dad (before he left) and even more of me with Grandaddy. But few with my mom. She was always behind the camera. Being behind the lens is something that must run in our blood. I’m a photographer. Thing 2 is a photographer. Thing 1 is kind of a photographer too. Luckily, there are other people with cameras who’ve taken photos of me with my girls, even though I’m almost always behind the lens of my camera. 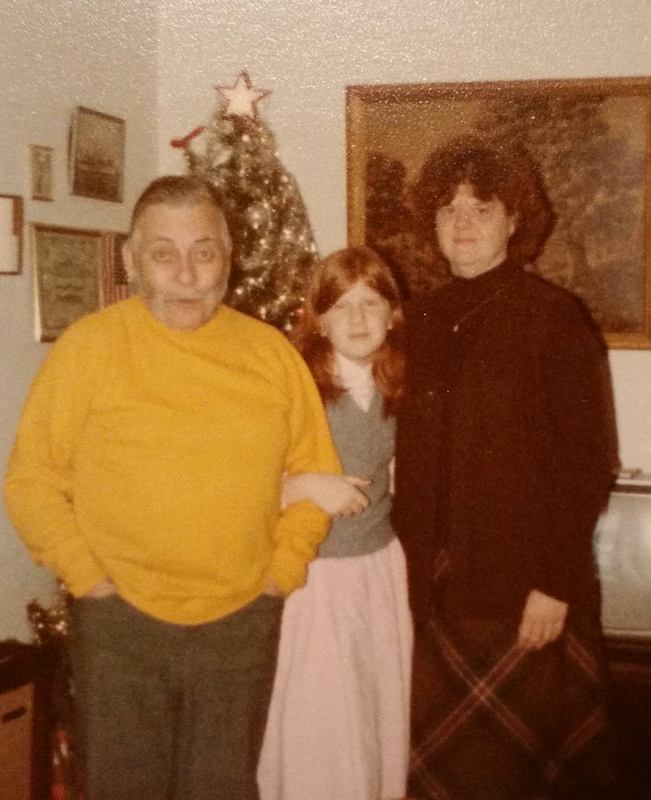 This is Grandaddy and Mommie and me. I’m not sure why Mommie and I are dressed up and Grandaddy is wearing a sweatshirt. Maybe we girls were going somewhere just the two of us? I don’t know. I was probably in sixth grade so that would make it 1982…maybe? 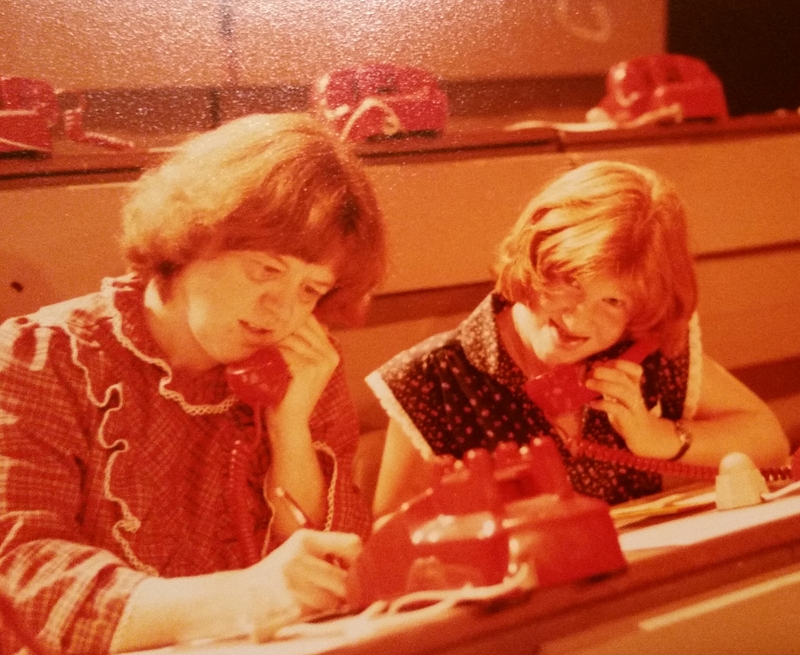 I did find this one of us working a WETA telethon. (taken before we were actually on the air) I had this mad skill of sticking out my tongue just as the shutter clicked. And our hair is really terrible. This was the next year or so. My mom hated my long hair and cut it all off one afternoon under the guise of giving me a “trim”. Circa 1983? This one was taken in November of 2000 by Thing 1. We went to see “Grandmommy” for Thanksgiving. This photo was taken sixteen years ago this same month. I love this photo because we look happy to be together. I recently removed it from the album and put it in a frame. Five years ago this day, my mother’s life ended. She died the Monday before Thanksgiving. The girls and I drove down to see her body (before it was cremated) on Wednesday, the day before Thanksgiving. 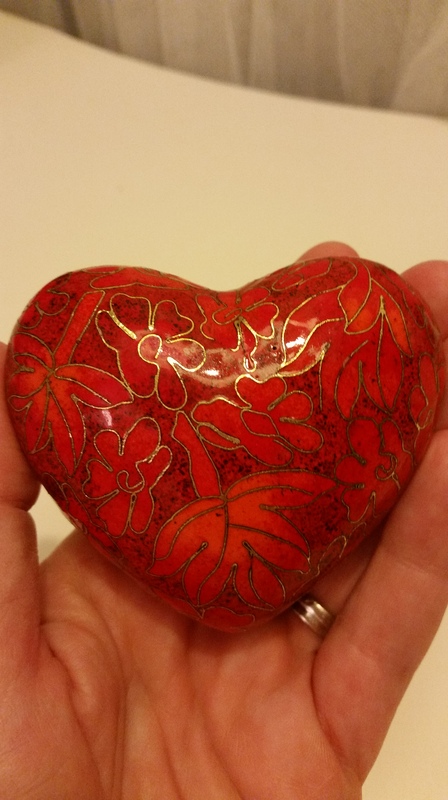 The little bit of my mother’s ashes that belong to me are in a tiny enamel heart shaped container. Sometimes I take it out of the blue velvet box and hold it in my hand. Sometimes I hold that heart to my own heart and imagine that we can feel each other’s love. 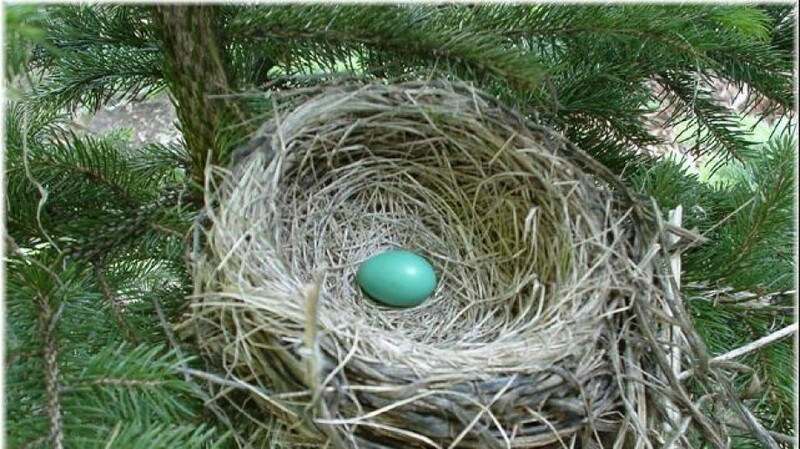 A small stuffed robin bird sits atop the blue velvet box. The blue velvet is on a small cedar box filled with memories. 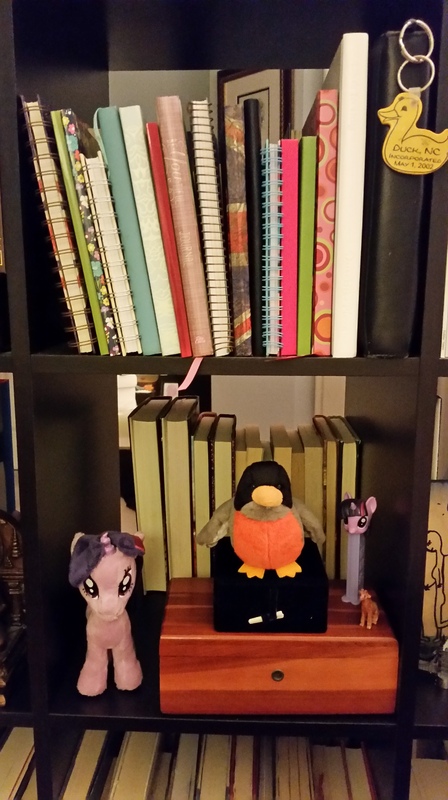 The small cedar box is on my bookshelf below my collection of journals. This is the side of the shelves that face my work tables and comfy reading chair. So I can see it whenever I want. In some ways, five years is the blink of an eye. In others, it’s a long, dark eternity. I’ll always have a complicated relationship with my mother. It wasn’t sorted before she died, but that’s because of who she was. And I guess that’s OK too. I know she loved me. I know I loved her. Love and sympathy from an English guy.